National Pallets makes pallet delivery to Ireland easy and straightforward. As the UK's largest online pallet distribution company, you can rely on a safe, secure and cost-effective pallet delivery service. Your pallet is treated as though it is being delivered within the UK - with no extra pallet shipping documentation required or customs charges to pay. Send pallets to Ireland and get a pallet quote! Ireland is a small island in the North Atlantic, it is separated from the UK by the North Channel, the Irish Sea and St George’s Channel. Its proximity to and long history with Britain has made it a key trading partner, which means shipping pallets to Ireland is in high demand. Despite being a fairly small island with a population of less than 5 million, Ireland has a strong import and export economy with its main traders are the USA, the UK, Belgium, Germany and Switzerland. When sending pallets to Ireland, you can be assured that your pallet delivery will arrive safely and on time with our excellent service. Pallet delivery to Ireland has never been easier, so make sure you choose National Pallets for the best price. A leading pallet service that puts all customers first, building a long-lasting relationship for first-rate pallet delivery to Ireland. Why not check out all our pallet delivery services from the UK to Ireland? Simply request a free instant online pallet quote by using the quick quote button and send pallets to Ireland today! Do I need to deal with customs when shipping a pallet from the UK to Ireland? No. 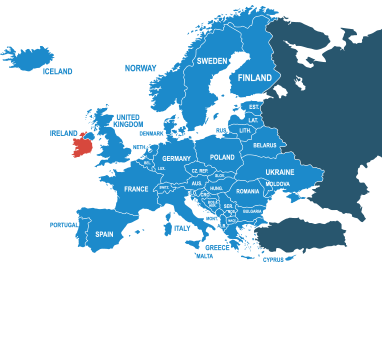 As Ireland is a member of the European Union, you don’t need to worry about dealing with international customs when shipping your pallet. How much does it cost to send a pallet to Ireland from the UK? You can send a standard quarter pallet (up to 250kg) for as little as £79.30 ex VAT. For more information on pallet prices and dimensions, click her to get an instant quote. Orders must be placed before 11am if importing or exporting to Ireland to qualify for quoted timescales. Standard delivery time is 3 days, however premium 2-day delivery is also available. We are able to ship the majority of goods to and from Ireland, however there are some exclusions, these are listed below. Plants and seeds and certain pharmaceutical products are subject to special regulations. *Orders must be placed before 11am if importing or exporting to Ireland to qualify for quoted time scales. Prices quoted based on quarter size pallet with economy options selected. Delivery & collection prices subject to VAT.